Welcome to the Hamilton County Historical Society web site! 14 Sep 2018: We are having a special presentation at the Red Barn on September 18th at 7 P.M. 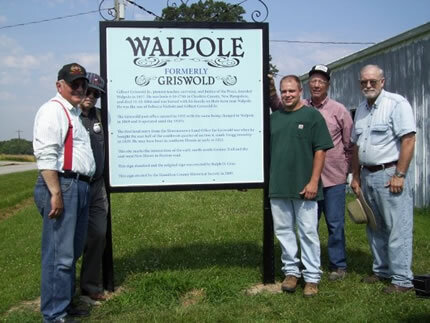 The speakers will be Willie & Kenny Grubb, who will be speaking about the history of Belle Prairie City. Refreshments will be provided. 4 Aug 2018: Museum and Gen Library hours changing: Both are now open Wednesday and Friday 11am to 2pm. 11 May 2018: Pre-Publication Notice for Sanders Funeral Home, Vol. 2. Sanders Funeral Home Records, Volume 2, is now at the printer's. We are offering a discounted pre-publication sale to try to offset the cost. If you would like to order one, print out the flier here, fill it out and send it, along with your check, to the address listed at the bottom of the flyer. 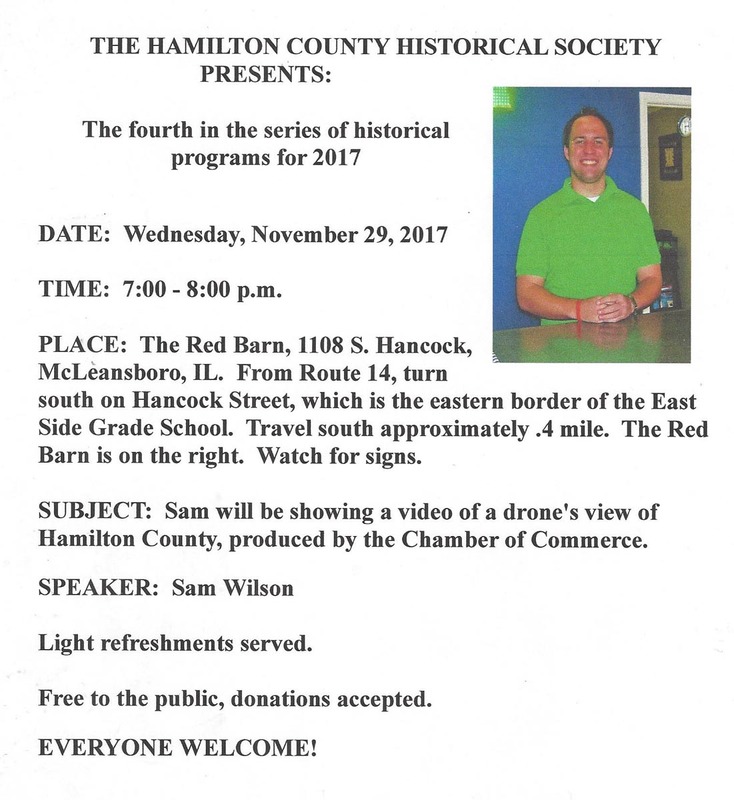 16 Nov 2017: A special meeting on "A Drone's View of Hamilton County" was held on Wednesday, Nov. 29, at the Big Red Barn. Click here for details. 15 Oct 2017: New publications are available! A 2018 Early Schools of Hamilton County calendar and a book on the 1925 tri-state tornado. Click here for a calendar flier or here for the 1925 book or select the Publications tab above to view/order. 19 Sep 2017: A special meeting on Indian artifacts found in Hamilton County was held on Wednesday, Sept. 27, at the Big Red Barn. Click here for details. 13 Jun 2017: Here is a flier about our next Historical Presentation to be given at the Red Barn on June 28. Please mark your calendar for this event. 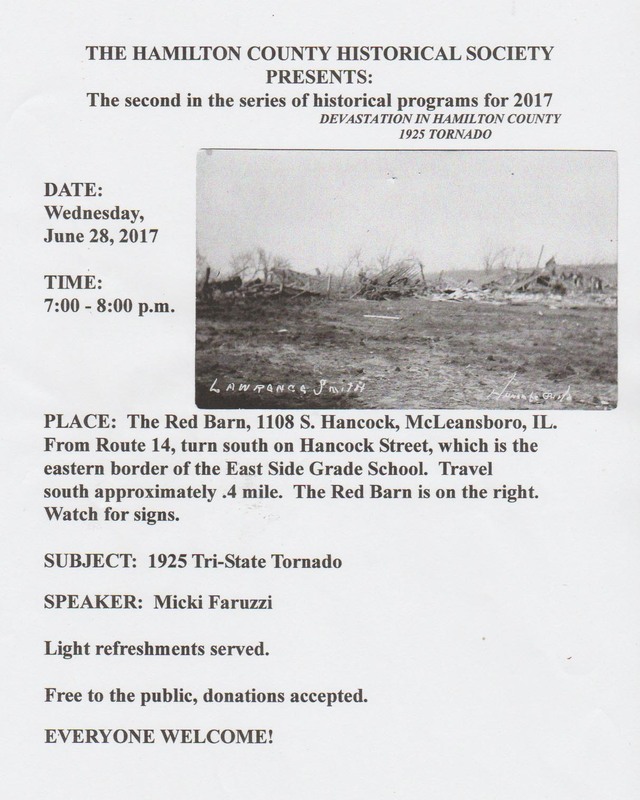 Micki has been researching a lot about the 1925 tornado and its effect on Hamilton County and surrounding areas, and will be presenting interesting and little-known facts about this horrific event, the longest tornado ever recorded. Please try to come. 4 Dec 2015: The HCHS took part in the 2015 Christmas Parade. Here is a picture of our group. 7 Dec 2014: The Open House for the 50th Anniversary of the Hamilton County Historical Society was held at the library on December 7, 2014 from 2:00-4:00 p.m. The Cloud and McCoy families were present to tell about their life when they lived there. The whole house was decorated extra special for Christmas. Click here for images of the event. 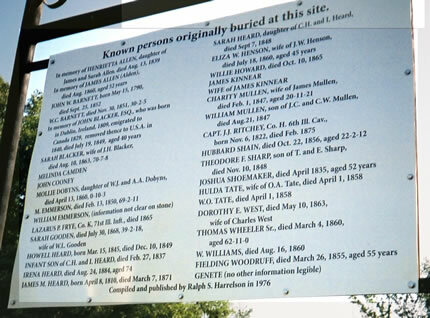 7 Oct 2013: The 2013 Cemetery Walk was held Saturday. October 5th. Unfortuantely, due to inclement weather, the actual Walk had to be held inside the old high school gym. Click here for images and additional information. 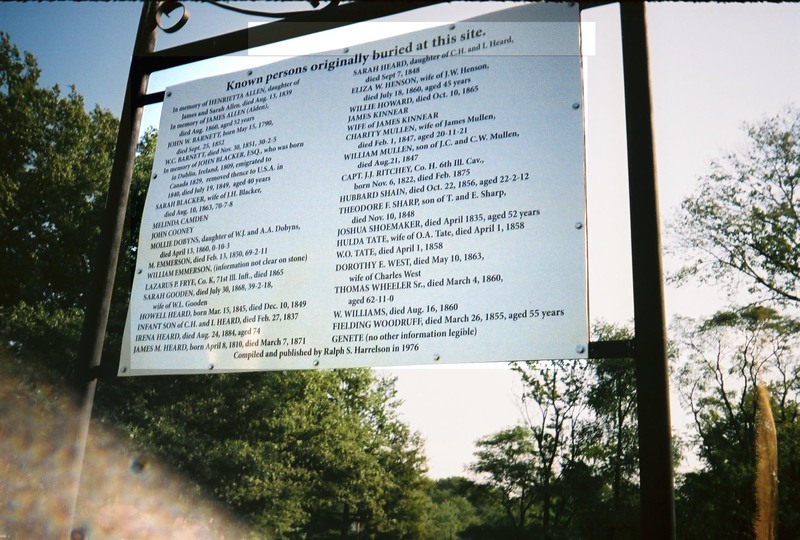 Click here for images of the May 2012 Cemetery Walk. Sep 2012: The Fall Festival Parade was held Saturday, September 15, 2012. To open a new page to view photos of the event click here. 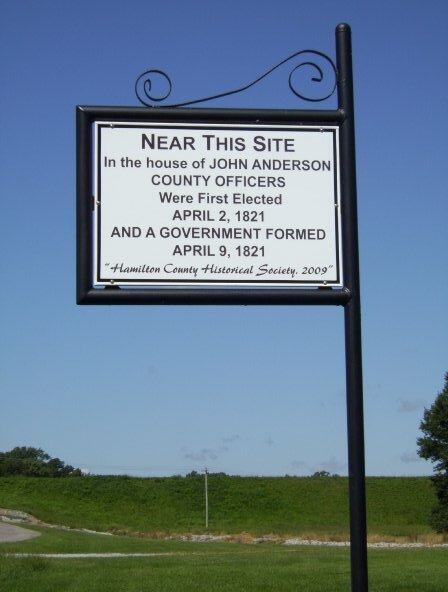 What is the Hamilton County Historical Society? 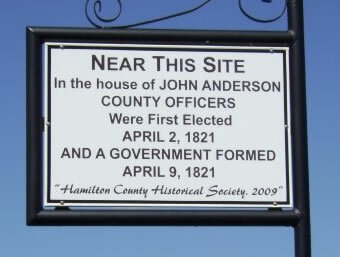 The purpose of the Hamilton County Historical Society is to bring together those persons interested in history, and especially in the history of Hamilton County, Illinois. The Society's major function is to discover and collect any material which may help to establish or illustrate the history of the area and to arouse interest in the past. 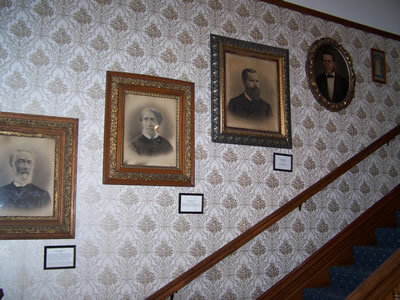 The Society maintains a museum and genealogy library on the second floor of the McCoy library where these items are preserved and made accessible to those who wish to examine them. Regular meetings will begin at 7:00 p.m. unless notified otherwise. The place will be the Farris Family Restaurant as shown below. The next meeting will be on April 23rd so mark your calendars. Jerry Prince is the speaker. He will be speaking about gravity powered downhill racing. When: Tuesday, 23 April 2019 at 7 p.m. These are the publications that are available for purchase from the Hamilton County Historical Society. Click on the thumbnail image to the left of each book title for a brief description of the contents of the book. When you are finished viewing the description, close the page to return to this screen. To order a book, click on any of the form links below (or on each book page), print the order form, fill it in, and send it with payment to the address provided on the form. The library has many Hamilton County publications and many from the surrounding counties. There are also many genealogies that have been submitted by users of the library. To view a list of those genealogies in a popup window, click here. If you are coming to the library from out of the area, it is recommended that you call ahead to verify that the library will be open on the day you expect to arrive. A single question or a few questions will be answered for free and can be done by e-mail or phone. If the research involves making copies and sending them to you then you will be charged the cost of the copies and the postage. 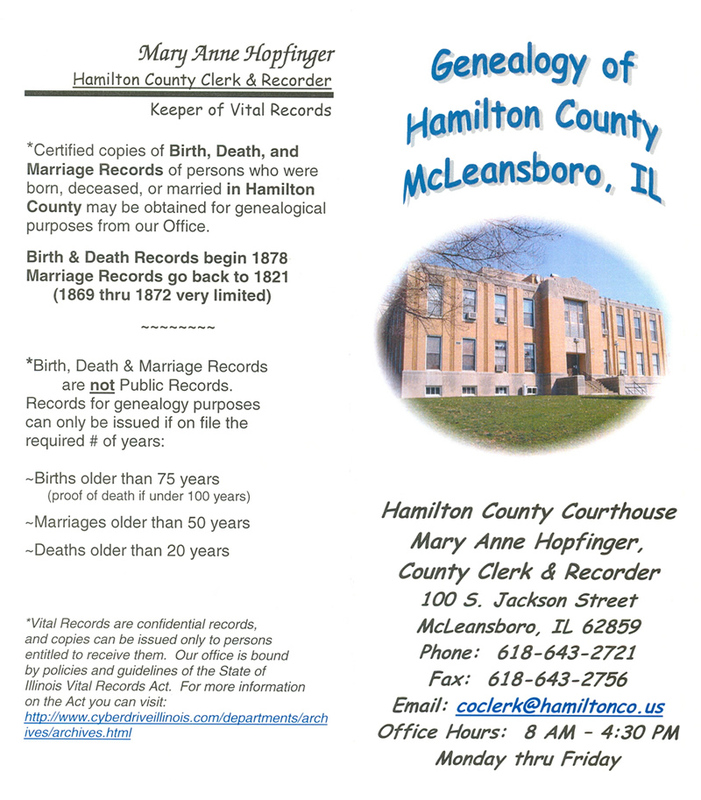 Detailed genealogy research in the Library and in the Hamilton County Courthouse can be done by the staff of the Genealogy Library. We have a questionnaire you will need to fill out. Click here to access the questionnaire. Fees for detailed research are $5 per hour plus cost of copies and postage for in-house research and $8 per hour (with 5 hour minimum) plus cost of copies and postage for outside research. Also any cost of copies from other source which researcher would obtain. i.e., death certificates, marriage license, birth records. Photographs of headstone can be provided when available. Please send your requests to: hchsgenealogy@gmail.com. No research will be started until you are informed of any costs. Click here for information regarding the availability of records, contact information and other County clerk information. Contact the County Clerk directly for information concerning the cost of searching for Birth, Marriage, or Death information. Wednesday and Friday: 11 a.m. - 2 p.m. The Hamilton County Museum is located on the 2nd floor of the McCoy Memorial Library across the street from the Hamilton County Courthouse. This beautiful building, with its white gingerbread and black iron trim, was the former home of Mary Ellen and Chalon Guard McCoy. Her father, Aaron Guard Cloud (1818-1893) had the house built by the Reid Brothers of Evansville, IN, in 1882-1884. He also owned the Cloud State Bank on the lot next to the house, built in 1880-1882 by the same contractors. 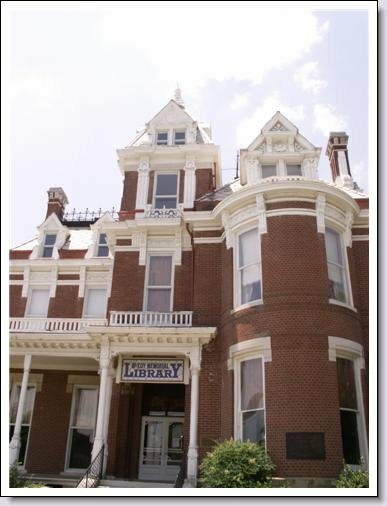 The McCoys had no children or close relatives, and when Mary Ellen, then a widow, died in 1921, she left the building and its contents to the City of McLeansboro for use as a public library. Mrs. McCoy also left an endowment fund of $5,000 for the operation and upkeep of the library. She also specified that the upper rooms could be rented or leased to supply needed funds. Shortly after she died, a stairway was added from the south entrance to the second floor, so that people using the second floor would not have to go through the library. This second floor now houses the museum, but the south stairway is closed. Rooms on the second floor have been used as city offices, professional offices, Chamber of Commerce, oil company offices, a photographer's studio, and apartments. One of the first tenants was Hungate's Studio. The last tenant was Dr. Ralph Hall, D.D.S. Rooms were used by the Red Cross as an emergency hospital after the tornado of 1925. 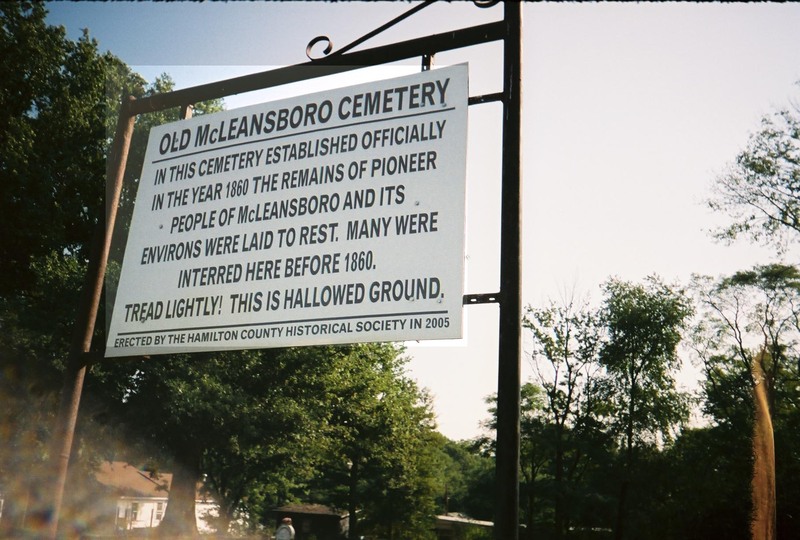 When the library building was built, there were no paved streets, no running water systems, no sewer lines or central heating systems in McLeansboro. Very few homes had clothes closets. The Cloud mansion had built in closets and was provided with running water by having a large cistern at the northwest side of the building. An iron pipe led to the kitchen, then to the attic to a hand pump. Water was pumped to a 500 gallon tank to supply water with a gravity flow. The Clouds made their own gas for the gas lights throughout the house. A large metal tank was buried on the lot which the bank occupies. Carbide was placed inside and water was added. This created a combustible gas which was piped to the chandeliers. The gas pressure was controlled by a regulator called a carburetor which was on or near the tank. Cloth mantles were used as are sometimes seen in the oilfield homes. In the late 1890's, when electricity came to McLeansboro, Mrs. McCoy had a number of her gas chandeliers wired so both gas mantles and electric bulbs could be used. Most homes at this time were heated only be fireplaces. The Cloud home was constructed with seven chimneys and nine fireplaces, all of them different and quite decorative. All rooms had a fireplace except two servants rooms, the bathroom, kitchen, and halls. In the center of the basement is an area like a large oven with a chimney where wood and coal were burned for hot air gravity heat. There are outlets in the rooms of the first and second floors. Later steam radiators were added and a coal stoker-fired furnace. Now a gas-fired boiler heats the water for the steam radiators. The museum is accessed through the library by a massive stairway, which is unusual in that there are no upright supports for the stairway. Halfway up the stairs, after the landing, there hangs some pictures on the wall of the Cloud/McCoy families. First is Aaron G. Cloud, the builder of the house. Next is his wife, Eleanor McCoy Cloud. Next to her is Chalon Guard McCoy, husband of Mary Ellen Cloud McCoy, followed by Chalon Guard Cloud, Mary Ellens brother. The last picture is of Mary Ellen herself in her wedding gown. At the top of the stairway is a large afghan depicting scenes from Hamilton County. Under the afghan is a display case showing the Lindell Hotel Register book, a soap turen and napkins used by the Hotel during its operation. It stood where Dairy Queen is now. 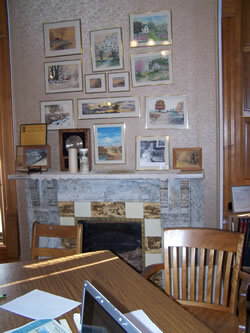 Surrounding the Register are pictures of some of the old homes and businesses in McLeansboro around 1900. Under the table are two 1820 land sale certificates. Turning to the left, both sides of the hallway are covered with artwork done by local artists. On the right is a desk used in the 1st court in McLeansboro in 1821. On the left is a display case showing various old tools, etc., including an embalming kit used by undertaker Joe Allen of Dahlgren, and one of the first homemade radios in McLeansboro. At the east end of the hallway is a display case showing Arthur Allens famous border collies. He showed them all over the country and they were even in a few movies. Above the case are pictures of Ray Blades, a hometown boy who played with the Cardinals in the 1930s. On the other side of the hallway are several frames of pictures which can be turned to view both sides. These are old pictures of churches, businesses, railroads, farms, homes, county beginnings, prominent people, the first airmail flight, the 1908 baseball team, a 1909 motorcycle, a 1918 fire truck, etc. Turning to the north, there are two doors side by side to what were bedrooms at one time. Going into the northeast room, there is a very interesting desk, called a Wooton desk. It was named after its designer, W. S. Wooton, a Quaker minister and cabinetmaker. His patent was for a desk which allowed "no excuse for slovenly habits in the disposal of valuable paper". Wooton desks were manufactured by the W. S. Wooton Desk Manf. Co., Indianapolis, IN, from 1874 to 1884. They were advertised as "the most complete desk in the world." In 1876, the plainest desks sold for $100-$120, while the "Superior Grade" had a price tag of $500-$750. The Wooton desk found its way into some of the finest homes and offices of the era, such as Joseph Pulitzer, founder of the New York World newspaper, John D. Rockefeller, the well known wealthy business tycoon, President Ulysses S. Grant and England's Queen Victoria. The Wells Fargo Company also made good use of Wooton desks as mobile offices for its stage and courier services. 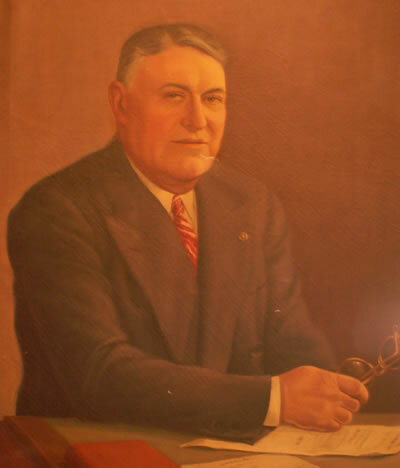 Also in this room is a picture of John H. Stelle, former Governor of Illinois (1940). Governor Stelle, known as the "Father of the G.I. Bill," was from McLeansboro. He served as Lieutenant Governor under Henry Horner, and upon Horners death, became Governor. Next to Stelles picture is a table with the county seal, an early typewriter, and an old check protector displayed. Next to the table is a round homemade pulpit built by Rev. Dr. Sylvester Brock for the Mt. Nebo United Brethren Church, which he founded in 1870. Sitting on top of the pulpit is a Bible which was given to John Stelle by J. R. Cross as a token of their friendship. The last display in this room is a case filled with old school pictures and memorabilia. Going into the other of the two doors on the north side of the hallway, one can see the only room that has been furnished as a bedroom, complete with its chamberpot. In this room, one can imagine what it was like to have lived in this mansion, one of the finest in the country. The built-in closet was a rarity in that time period. 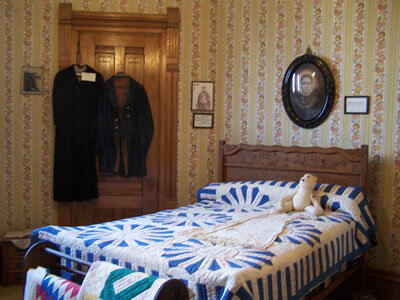 On the bed is displayed a quilt that was made in 1939 by the employees of Elders Shirt Factory for Maycel Yoder when she retired from there. It contains the names of every employee embroidered on the various blocks. Across the hall is a large room which was once two bedrooms, but the middle wall was taken out when City Hall occupied the rooms. That is the reason this room has two fireplaces. In this room you will find the first piano brought to Hamilton County. It is a "square" baby grand and does not have a full keyboard (only 82 keys, rather than 88). It was purchased in Cincinnati by Charles Heard for his daughter and was shipped by boat down the Ohio River to Shawneetown, then brought to McLeansboro by wagon. Also in this room are two spinning wheels and showcases containing various items which have been donated to the museum, including a collection of books by H. Allen Smith, famous humorist who was born in McLeansboro. On the wall is a painting done by Mary Ellen McCoy. She was a fine artist and her pictures may be seen throughout the library and museum. Turning left in the large hallway, then back to the right past the stairs, there is a smaller hallway leading back to two small rooms which were once the servants' quarters. This hallway and the back room now contain military memorabilia. 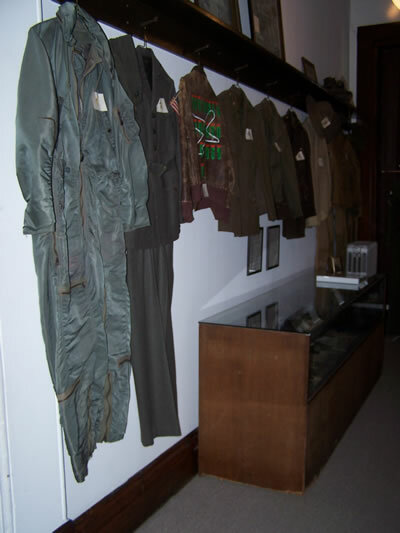 Several uniforms from various wars line the hallway wall. One mannequin wears a uniform from the Vietnam War and another a WWI Army nurse uniform. The back room also contains a mannequin wearing a World War I uniform. The other small room is now a bathroom. In it is an article of furniture resembling a wooden chair, which is a portable toilet on wheels that can be rolled from room to room. Next to these rooms is the "servants' stairs". This is a small staircase leading from the 2nd floor all the way to the basement, where the summer kitchen was housed. In the wall a few steps down, one can see the door to the dumbwaiter, in which food could be sent from the kitchen to all floors of the house. Going back to the large hallway, looking south, there is a large sleigh. On the wall is some more artwork by local artists. This room was Mary Ellen McCoys studio where she did her painting. 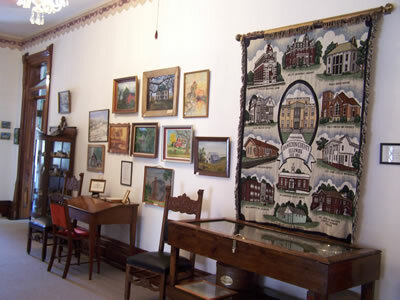 The large display case on the left contains articles about Estill Drews movies showcasing local people, the old Cornbleet dress factory ads and pictures, and some items from the Mt. Pleasant Christian Church (communion glasses, offering plate, lamp, Bible, etc.) The other display case holds original books from the Cloud family collection. Across the hall is an old stitching horse. Through the door to the left (west), is the room which was originally the McCoy's bathroom. 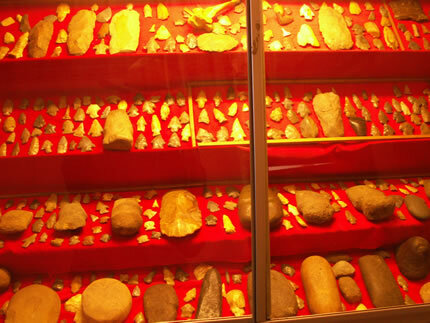 It now holds a large collection of Indian arrowheads, and a display case of the Behme hanging, 1896 (the only hanging ever held in Hamilton County). There is also a large picture of Abraham Lincoln. 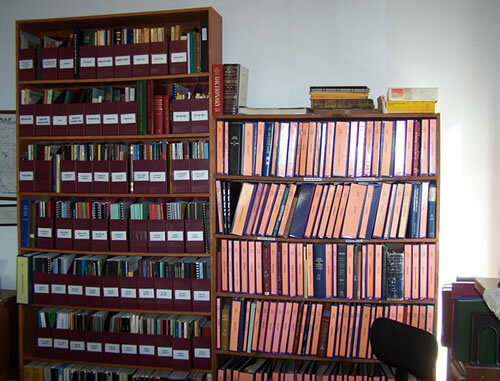 The southwest room is now the genealogy library, which is used quite extensively by researchers. This was originally one of the bedrooms. You can still see the intercom system they used just inside the door. It is a small round porcelain device in the wall in which a person could speak. One of the interesting things about this house is all the different types of wood which were used. Two of the rooms on the second floor are done in chestnut wood, one is finished in cherry wood, and two were originally finished in white enamel. The two servants rooms and the bath were pine and walnut. A large storage room is furnished with cabinets of clear pine, and the large hallway woodwork is of handcarved walnut. The McCoy Memorial Library building is listed in the Illinois and the National Register of Historic Places. Many visitors pass through this building every year and are struck by its history and ornate structure. It's unique architecture has become one of the most identifiable sites of McLeansboro. The HCHS Newsletter is issued semi-annually; once in the Spring and once in the Fall. There are currently 6 issues available. In 1978, the Hamilton County Historical Society obtained a grant of about $12,000 from the Federal Comprehensive Employment Training Act to record and transcribe oral history from some of the elderly residents from the community. Charles Frey and a group of staff members interviewed and recorded more than 100 people about subjects such as the Great Tornado of 1925, old stores, communities, kinfolk and memories of days-gone-by. After being stored away for almost 30 years, the Historical Society converted and preserved all 240+ cassettes to CD and have made them available to the public for the first time. This process took almost 3/4 of a year to complete. Interviews vary in length, therefore, some interviews are on multiple CDs. If you wish to order an interview, it costs $5 per CD. While we have CDs for most interviews, we have written transcripts for about a third of the interviews. It costs $10 per transcript, if available. There is a flat $3 shipping/handling fee for any order for Oral History Project CDs or transcripts. These CDs are available for purchase from the Hamilton County Historical Society. To order any CD, click on any of the form links below, print the order form, fill in the order form, and send the order form and payment to the address provided on the form. 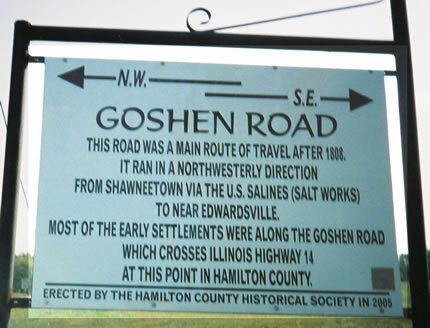 The Hamilton County Historical Society has erected five Historical markers throughout Hamilton Co., IL. Click on each image to load a much larger copy in a separate window for better viewing. Old McLeansboro cemetery located in McLeansboro (front). 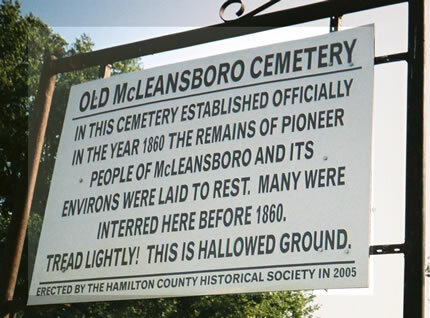 Old McLeansboro cemetery located in McLeansboro (back). 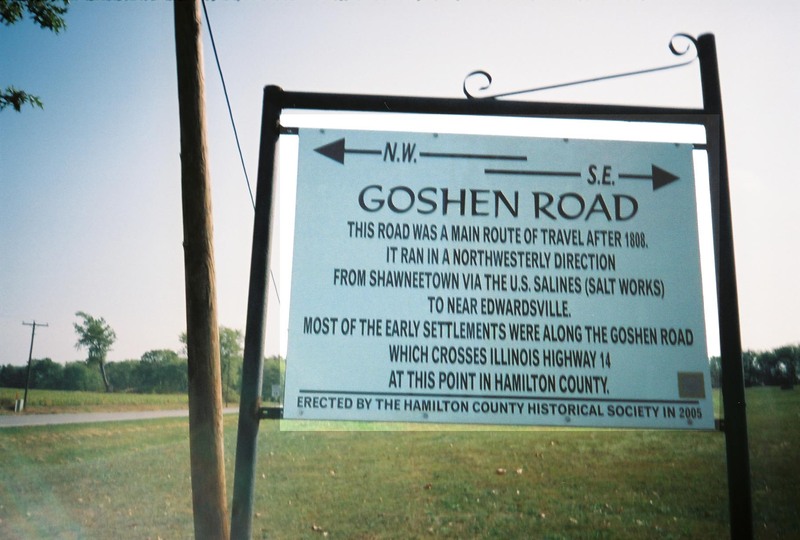 Goshen Road sign located ___. 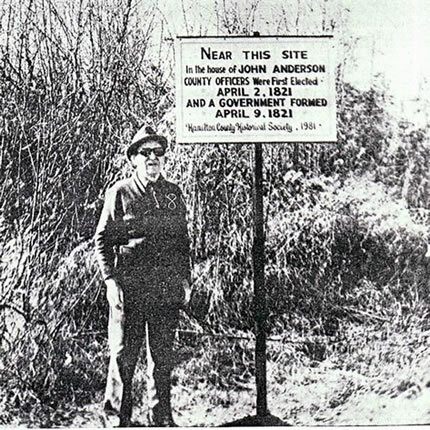 Original John Anderson sign erected 1981. All links below will open in a new window. Close the new window to return to this page.